Welcome to MDCresearch.net section for Parents of children who are Deaf/Hard of Hearing. Do you understand the implications of how much you speak to your child every day and its impact on language development for your child who is Deaf/Hard of Hearing? Do you know how to use the assessments that your Early Intervention Provider uses to track your child’s progress can be used to help your decision making in communication and language outcomes? Do you know how to respond when someone uses ‘research findings’ to support their own bias about how they think you should raise your child who is Deaf/Hard of Hearing? These are some of the questions being answered by researchers involved in information included on this website. This page will help you to think about research from a parent’s perspective, and to help you as a parent understand why research is important, how to navigate and use information from this website, and to help inform you of how clinical practice is molded and shaped based on research. How can parents use research findings to understand the needs of Deaf/Hard of Hearing children? What should a parent do when a professional uses ‘research’ to support a particular decision? Should research findings be the only thing a parent considers in language and communication choices? As “scientifically-based instructional practices” that have some evidence in research as being effective and replicable become more and more the standard by which early intervention for D/HH children should be applied, it is important for families to understand which research findings may apply to their particular child. Families use a variety of information to guide their decisions for their own child. These include findings from research, but also subjective ‘gut instincts’, parental preference, child preference, and available resources in a community. Research findings are very valuable in finding evidence for decision making beyond people’s opinions, and yet, at the end of the day, it is a parent’s right and responsibility to make decisions for their child in context to a lot of information as shown in the chart below. 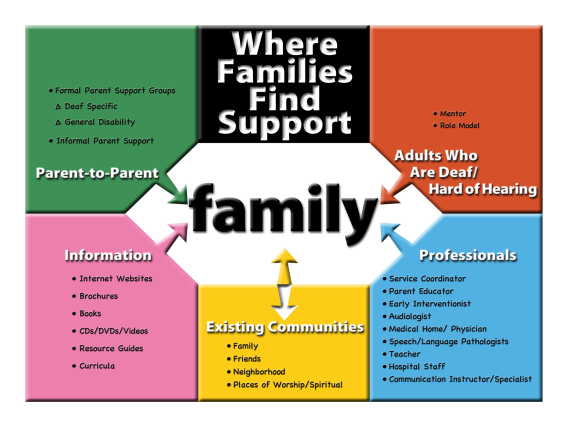 How does the family benefit from participating in research and assessments to help individualize the intervention you child needs? Research often results in assessment tools that interventionists may use with families to assess a child’s progress. This information is invaluable in looking at the objective progress in the areas of development for the child. As you browse information and research findings on this website, please contact janet@handsandvoices.org if you have any questions. More information and explanations specifically for parents are under construction throughout the research sections within this website. Researchers involved in the projects on this website are also willing to help families in understanding the applicability of their work to a child’s progress. Check out this powerpoint how Hands & Voices as an organization has partnered with other Universities and agencies to further enhance research to enable parents and children who are Deaf/Hard of Hearing reach their full potential. Coming soon: More information specifically for parents will be imbedded throughout this website. Look for the information marked “For Parents!” in the purple boxes throughout.